You negotiate every day of your life. Whether you are asking your employer for a raise or persuading your child to do his homework, everything is a negotiation. Written by Gerald Nierenberg, the world's foremost authority on the subject, and recognized as the Father of Contemporary Negotiation, The New Art of Negotiating is an updated, expanded version of the million-copy bestseller , The Art of Negotiating, which was the first on the subject of negotiating and introduced us all to the art of effective negotiation. The Negotiation Institute which he founded, is the longest negotiation skills seminars and training in the world. When The Art of Negotiating first appeared, it taught us that negotiation doesn't have to be an adversarial process that ends in victory for one party and defeat for his hapless rival. Since then, the landscape of business has changed greatly. 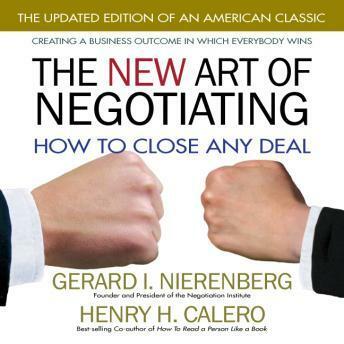 The New Art of Negotiating provides Nierenberg's effective strategies redesigned for today's world. You will learn how to analyze your opponent's motivation, negotiate toward mutually satisfying terms, learn from your opponent's body language, and much more. Throughout, the author will guide you in successfully applying his famous win-win tactics to the bargaining process. Once, Gerald Nierenberg changed the way we think about negotiating. Now, The New Art of Negotiating allows us to experience win-win success in today's business climate.